You are at:Home»Grub»Day 18! Whole30 Orange flavored chicken for dinner? YES!! When you’re having that Chinese food craving but don’t want the calories, carbs, and cholesterol that it brings, try this healthy alternative. 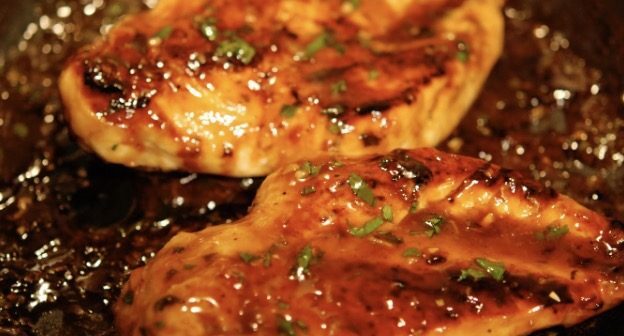 You can marinate the chicken a day in advance for maximum flavor. The marinade also goes well with shrimp. In a dish, combine the basil, zest, orange juice, and mustard. Add chicken to the marinade mixture and refrigerate for 1 hour up to overnight. Preheat the broiler. Brush a baking sheet with the olive oil and set aside. 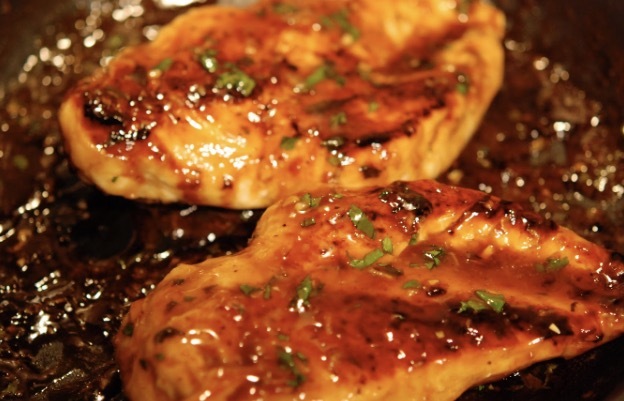 Remove chicken from the marinade reserving the liquid. Sprinkle chicken with with salt and pepper. Place chicken onto the baking sheet and spoon the reserved marinade on top. Broil for 20 minutes on medium, flipping over once after 10 minutes. Let rest for 5 minutes and serve. Using food as reward (or as punishment) can undermine the healthy eating habits that you’re trying to achieve. Rewarding yourself or celebrating with food—even healthy food—disconnects you from the relationship we want you to build with food; a nourishing, sustaining, significant relationship. Here are other ways to celebrate your successes! After all, you are more than half way there!! Get a massage. Relax, recover, and improve your health in countless ways. Give yourself a 10-class punch card to your favorite yoga studio. Yoga is great for the body and the mind. Toot your own horn! Announce your success on Facebook, Twitter, your blog, or the Whole30 forum. You might end up inspiring someone else to take this journey with you. Pants fitting a little too baggy these days? Treat yourself to a new belt to hold ‘em up! Invest in a fabulous healthy-eating cookbook—money well-spent on your journey to lifelong health. Head out on a hike. You might be surprised at your increased energy and stamina. Sleeping more soundly because of the Whole30? Kick that up a notch with some luxurious, high thread-count bed sheets. Wanting to try kettlebell training, but think they’re too expensive? Today’s your day to splurge. Get together with friends for a whole30 dinner party! Good friends increase your happiness and lower stress! !